Replaced this paragraph from the original post because the brackets mentioned improved to the 97th to 98th percentile with Villanova's win. Here are all the approaches we laid out, and as you can see those based on www.valueaddbasketball.com with slight variations for other factors all placed near the top and picked Villanova - whereas choosing to go with teams with more NBA talent (Arizona or Kentucky, Duke to win it all etc.) does not work nearly as well as Value Add Basketball. 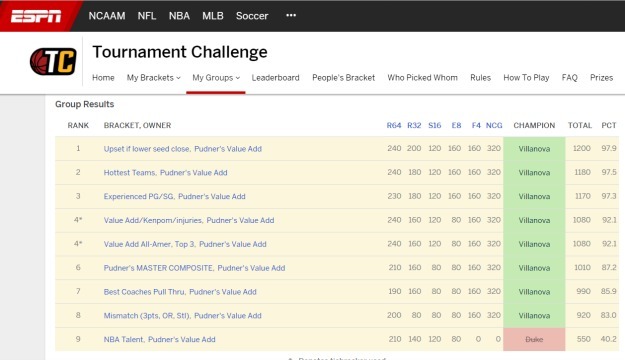 The very best approach was to use the Value Add rankings and make slight adjustments to either go with worse seeds when Value Add said the two teams were within a point of each other (Upset), adjust for the hottest teams between Feb. 1 and the tournament (Hottest) or adjust for the best and most experienced guards (Experienced). www.kenpom.com final ratings calculate Villanova as the second best champion of the century behind only 2008 Kansas. 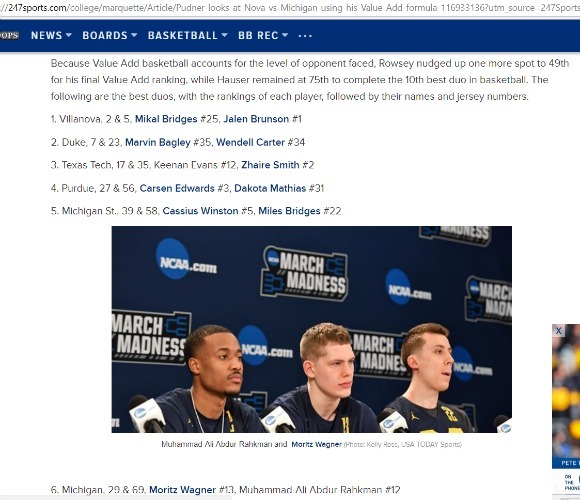 The second method (hottest) is the only one that projects a closer game - since Michigan is the hottest team in the country - but the fact that Villanova is the only team in the country with four top 100 players (out of 4,068) and has two top five players when no other team has two in the top 20 point to a solid Villanova win. While the Big Ten and Big East (more in-depth Value Add stories on CBS Dodds on Sports) face off for the title after solid tournaments, our in-depth breakdown of every conference from top to bottom shows that of the eight conferences that are at least five points better than the average conference they place right in the middle. Bad Conference Performances for Pac-12 and American. Meanwhile, Cincinnati's Gary Clark (14th) and Arizona's Deandre Ayton (11th) dropped out of the Top 10 as the American and Pac-12 tournament struggles lowered the calculation on how tough of opponents each had to overcome throughout the season. In the American, 2-seed Cincinnati, 4-seed Wichita State and 6-seed Houston only won two games between them, and Temple was the only conference team invited to the NIT where they lost their opener (albeit to eventual NIT champ Penn State). Seven of the eight Pac-12 teams invited to postseason play lost in either their first NCAA game or second NIT game - with only Utah salvaging some respect with a run to the NIT title game. (Breakdown of every team in every conference here). ACC, Big 12 and SEC Dominate Top to Bottom. Meanwhile, players surged in the Final Value Add rankings in the three conferences that dominated play. The full-breakdown matching how the No. 1 team in each conference would match up with the No. 1 in the other 31 conferences, and No. 2 vs. No. 2 etc. projects the ACC would be favored in 327 match-ups and underdogs in only 10, with the Big 12 just behind at 282-18 and the SEC at 314-23. While the Big Ten and Big East were next best, top-to-bottom there was a gap between the top three and the Big Ten and Big East, and then between those teams and all the others. A note: Bagley surged back up to 7th after missing four games due to injury. If he has played all 37 games instead of just 33, his projected Value Add would be 10.80 to make him the most valuable player in the country. Our forecasts of a Villanova Title were among the 16.3% of all brackets that chose them to win, so a win would improve the three brackets below ahead of even the 96th percentile, 95th percentile and 94th percentile in the current standings. Only 3.8% picked Michigan, so an upset by them tonight could propel many of those brackets above the brackets presented. The 80% of brackets that picked one of the other teams to win the tournament can only drop after tonight's game (rest of blog with average wins picked for every team and updates here).